Joppen, Charles <1878 - >: Historical atlas of India for the use of high schools, colleges, and private students. -- London : Longmans, 1907. -- Online: http://archive.org/details/historicalatlaso00jopprich. -- Zugriff am 2012-05-09. -- "Not in copyright"
"1. 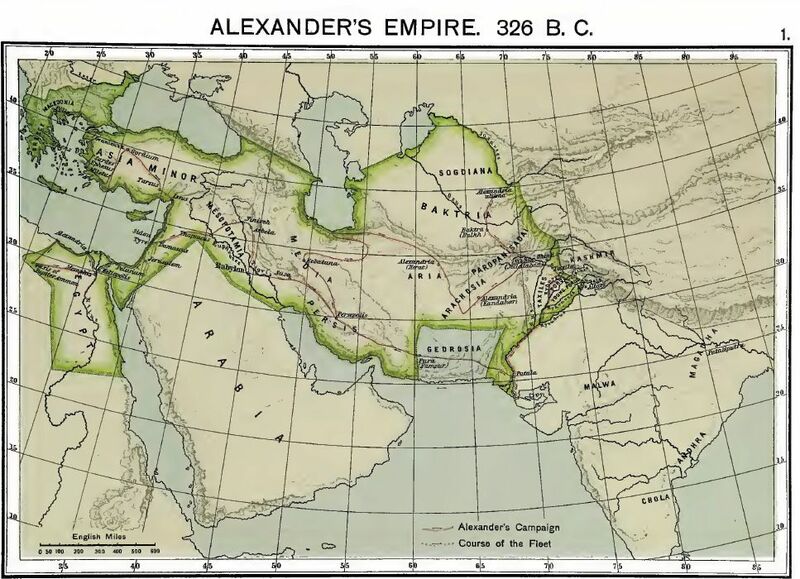 Alexander's Empire in 326 B. C.
This map represents the empire of Alexander the Great, king of Macedon, who from the Persians took Egypt and all western Asia as far as the river Indus. The course of his march (B. C. 327—324) is shown by the red line and its direction by the accompanying arrows. The Persian king Darius had annexed the Indus valley about the year 500 B. 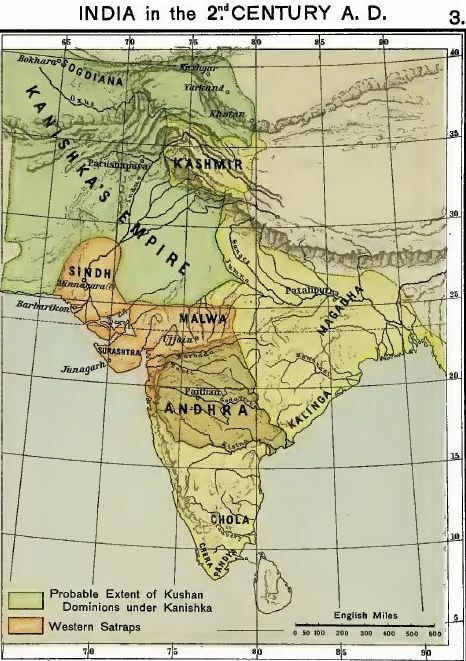 C, and at Alexander's time the Indus was the boundary between the Persian Empire and India, while the Punjab and Sindh were ruled by numerous native chiefs. The course of the Punjab rivers then differed from their present one, and large tracts of land which are now sterile were then fertile fields. The map shows the present courses of the rivers, as the ancient ones cannot be ascertained with certainty. From Nikaia, west of the modern Jellalabad, Hephaistion, one of Alexander's generals, advanced in 327 B. C. through the valley of the Kabul river, while Alexander himself marched through the hilly country north of that stream to protect his army from attacks on the flank and rear and to secure' his communications. In 326, having joined Hephaistion, he crossed the Indus, probably at Ohind, 16 miles above the modern Attock. Taxiles of Taxila, northwest of the modern Rawalpindi, had already submitted before Alexander's arrival. In the battle of the Hydaspes, on the eastern bank of that river, Porus, king of the country between Hydaspes and Arcesines, was defeated and captured, but was allowed to retain his country as a vassal. The Arcesines and Hydraotes were next crossed. But on the banks of the Hyphasis, finding his troops unwilling to proceed farther, the conqueror reluctantly gave orders for a retreat. Retracing his steps to the Hydaspes, he formed a fleet, and sailed down the river accompanied by contingents of his army on both banks, the larger portion being on the eastern side. After numerous fights with the tribes on both banks, he arrived at Patala. Having explored the western and eastern branch of the Indus, he himself marched back through Gredrosia and arrived at Susa in April or May 324, while his admiral Nearchus sailed through the Persian Gulf to the mouth of the Euphrates (dotted red line)." "2. India in 250 B. C.
Alexander seems to have intended a permanent annexation of the Indus valley and the Punjab; but when, after his death (323 B. C.) his vast empire was broken up, all his garrisons in India were destroyed or driven back. The leader in this struggle for liberty was Prince Chandragupta, then an exile from Pataliputra, but subsequently founder of the Mauryan dynasty of Magadha. He seems to have been the first supreme sovereign of Hindustan, his dominions extending from the Bay of Bengal to the Arabian Sea and reaching southwards probably as far as the Narbada. Seleucus, one of Alexander's generals, had made himself king of western and central Asia. 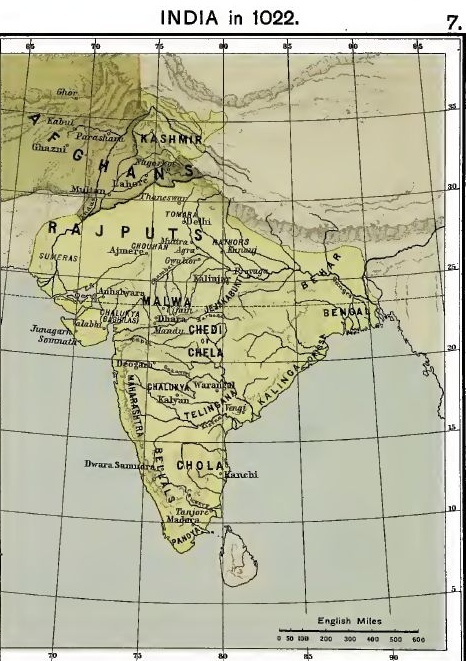 But in 305 B. C. Chandragupta, after a successful campaign, forced him not only to give up all thought of conquest in India- but also to cede the provinces of Paropanisadai, Aria, Arachosia, and probably Gedrosia (see maps 1 and 2). Thus the Hindu Kush mountains became the frontier of the first Indian Empire. Its capital was Pataliputra (now Patna). Chandragupta died in 297 B. C. and was succeeded by his son Bindusura (f 2,72 B. C.) and his grandson, the renowned Asoka (272—232). Asoka's Empire extended in the northwest to the Hindu Kush, and included most of the territory now called Afghanistan, the greater part of Baluchistan, and all Sindh. Northwards his dominions stretched to the foot of the Himalayas and seem to have comprised the districts around Srinagar (which was built by him) and the territory round Lalita Patan in Nepal, two and a half miles southeast of Kathmandu (also built by him). 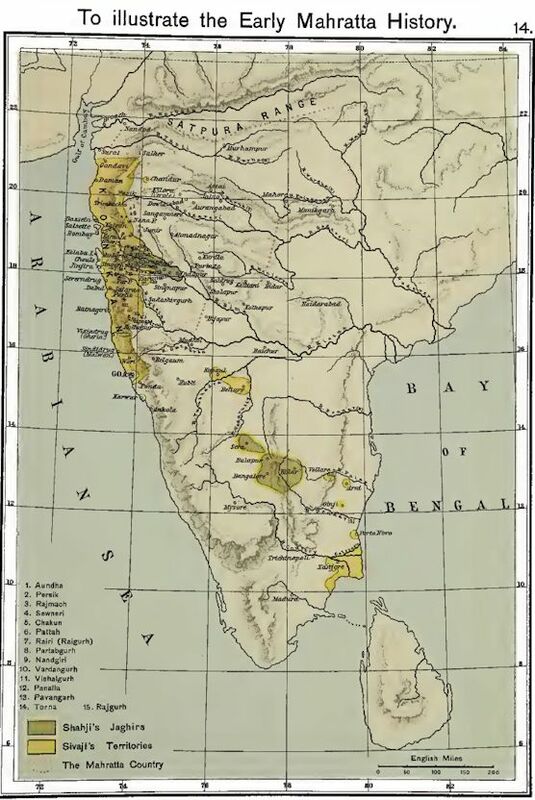 The whole of Bengal acknowledged his sway, and the kingdom of Kalinga (i. e. the strip of country extending along the coast of the Bay of Bengal from the Mahanadi to the Godavari) was subjugated in 261 B. C. The Dekkan had already been conquered either by Chandragupta or by Bindusura. The Andhra kingdom, between the Godavari and the Krishna, was administered by its own raja, but seems to have been a protected state. The southern frontier of the empire must have coincided closely with the 13th degree of northern latitude. The southern Tamil kingdoms of Chola, Pandya, Satiya, and Chera remained independent. The hill tribes within the limits of the empire seem also to have enjoyed a certain amount of independence. Asoka is noted for his rock- and pillar-edicts, which are scattered all over India and tell us much of his principles of government and of his ethical system. Embracing Buddhism, he became active in its propagation, dispatching missionaries not only over the whole of his empire, but also to Syria, Egypt, and Macedonia." "3. India in the second Century A. D.
Soon after Asoka's death (232 B. C.) his empire broke up and his descendants seem to have retained only Magadha and the neighbouring provinces; Kalinga and Andhra were among the first to acquire independence. 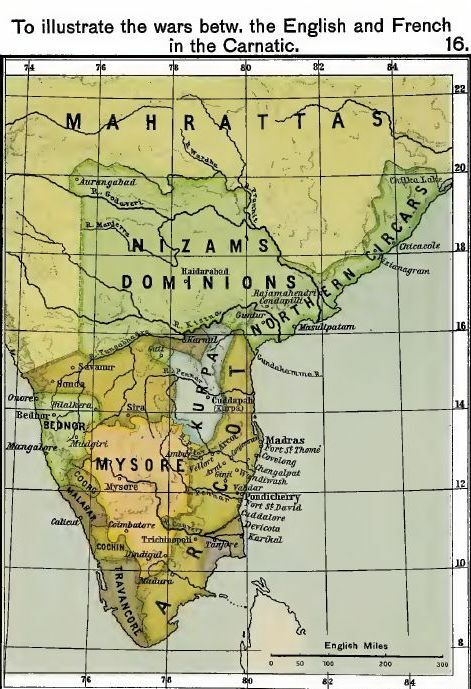 The Andhra nation, a Dravidian people, occupied in Chandragupta's time the deltas of the Godavari and Krishna (see map 2). After Asoka's death, they rapidly extended their power to the sources of the Godavari and soon stretched right across the peninsula from the Arabian Sea to the Bay of Bengal, probably including Magadha (c. 27 B. C). About the middle of the 2nd century B. C. hordes of Sakas, a pastoral tribe from the Jaxartes, established themselves in Sindh and Surashtra (the modern Kathiawar), and their chiefs assumed the ancient Persian title of satrap. Other foreigners also the Yavanas (Asiatic Greeks or others coming from Grecian kingdoms in the northwest of India) and the Palavas (Parthians from Persia), had by this time settled in western India as rulers over the native population. By the beginning of the 2nd century A. D. all these became subject to the Andhra kings. In 145 A. D., however, Surashtra, Malwa, Cutch, Sindh, and the Konkan became independent under Rudradaman, one of the satraps. The northern and western boundaries of Andhra can thus be fixed, while towards the east and south they remain problematical. The capital of the Andhra kings at this time was Paithan on the Godaveri. After Asoka's death Sogdiana, Baktria, the Kabul valley, and the Punjab were ruled by Greek and Parthian rulers, until they were overthrown by the Yueh-chi (Turki nomads), who in course of time became a settled nation. Under Kanishka, the third of the Kushan dynasty, they formed a mighty power, and waged a successful war even against the then powerful Chinese Empire. Towards the west Kanishka's Empire reached to the Persian frontier. In the east, he had conquered Kashgar, Yarkand, and Khotan. He ruled over the whole of northwestern India probably as far as the Jumna and the Chambal. Northwards the boundaries of his dominions are not clearly defined. The capital of his empire was Parushapura (the modern Peshawar). He acceded about 120 A. D. and was a Buddhist. The rest of India was at this time ruled by smaller Hindu rajas." "4. 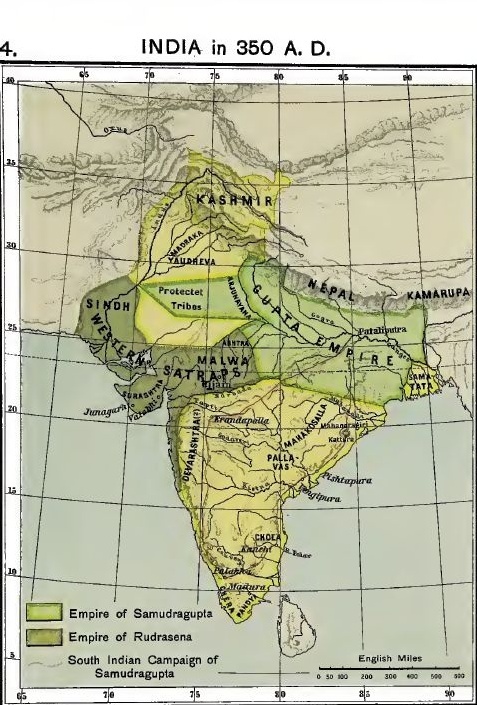 India in 350 A. D.
In the beginning of the 3rd century the Kushan and Andhra dynasties became extinct, and their empires were broken up into minor states. The middle of the 4th century reveals two other mighty empires, that of the Guptas and that of the Western Satraps. The Satrap Rudrasena and the Gupta Samudragupta were contemporaries. 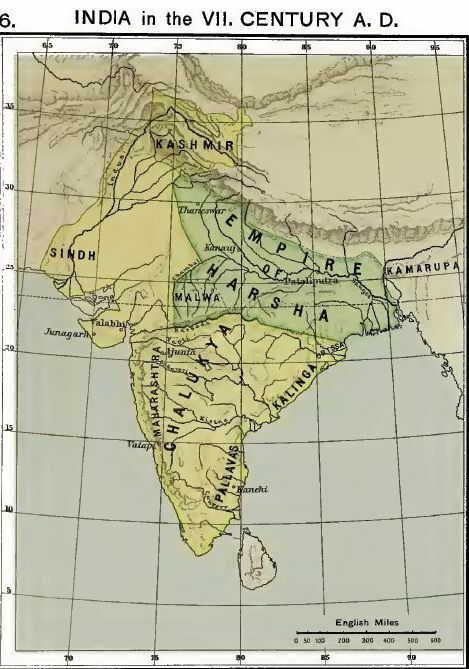 The Gupta dynasty came into existence at the beginning of the 4th century A. D. Samudragupta's dominions extended from the Hugli to the Jumna and Chambal, and from the Himalayas to the Narbada. Samatata (in the Granges delta), Kamarupa (the present Assam), and other smaller states were tributary to him. The clans in northern Rajputana were under his protection. Samudragupta organised a great campaign in the south of India, but achieved no permanent conquest. This campaign is of interest, however, because its records reveal the political state of affairs in the south. His first attack was directed against South Kosalla and the valley of the Mahanadi, after which he subdued the forest countries of Orissa, took the hillforts of Mahendragiri and Kottura in Ganjam, conquered Pishtapura (now Pithapuram), defeated the king of Vengi, the Pallava king of Kanchi (now Conjeeveram), and the Pallava king of Palakha (now Palghatcherry). Then, returning through the western parts of the Dekkan he subdued Devarashtra (probably the Mahratta country) and Erandapalla (Khandesh). This information about Samudragupta is wholly derived from the inscriptions on a stone pillar still standing in the fort of Allahabad. Towards the end of the 4ft century the territories of the Western Satraps were incorporated into the Gupta Empire." "5. The Empire of the White Huns in the VI. 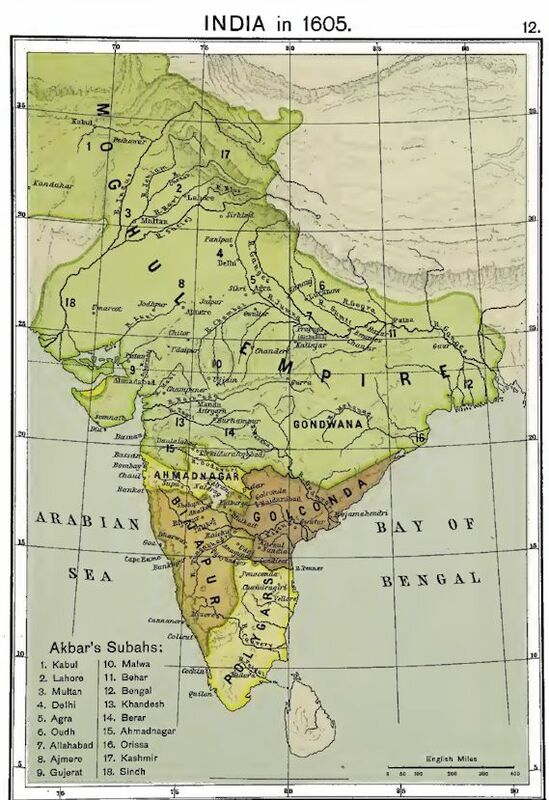 Century A. D.
Towards the close of the 4th century (A. D. 395) the kingdom of the Sakas or Western Satraps was overthrown by the Guptas, whose empire then extended from the Ganges delta to the Indus valley and the Arabian Sea. The Gupta Empire subsisted till the end of the 5th century when it was destroyed by the White Huns or Ephthalites. The Gupta dynasty, however, still retained possession of Magadha and the eastern provinces. The Huns, a Mongol tribe, while moving westwards from the steppes of Asia in the second half of the 4th century to seek subsistence for their growing numbers, divided themselves into two main streams. The one advancing into Europe was united subsequently under the terrible Attila, while the other directed its course towards the Oxus valley. 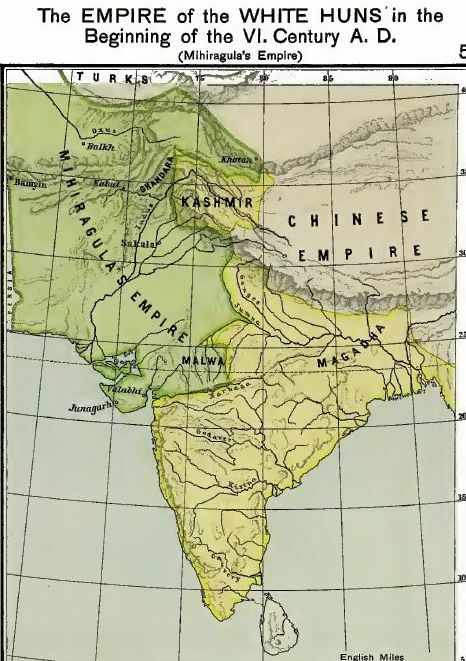 The latter section, known as the White Huns, overthrew the (Kushan) kingdom of Kabul and thence poured into India. About the year 500 they overwhelmed the kingdom of Gandhara (Peshawar) and overthrew the Gupta Empire. At the beginning of the 6th century the Indian dominions of the Huns were ruled by Mihiragula whose capital was at Sakala in the Punjab. India was, however, only a province of the empire. The headquarters of the horde were at Bamyin (near Herat), while Balkh served them as a secondary capital. The Hunnish overlord levied tribute from forty countries extending from the frontiers of Persia in the west to Khotan on the borders of China in the east. Malwa was then ruled by a Hunnish prince, and Valabhi and other kingdoms must have been tributary to Mihiragula. About the year 528 Mihiragula was defeated by a confederacy of Hindu princes under the leadership of the king of Magadha. Between the years 560 and 570 the Persians, allied with Turkish tribes, overthrew the White Hun Empire, and the Oxus valley and other countries occupied by the Huns were then annexed by the Turks." "6. India in the VII. Century A. D.
After the overthrow of the White Huns no supreme power existed in India until the beginning of the 7th century, when Harsha (606—647 or 648), originally king of Thaneswar, after a 35 years' war, became the lord paramount of the north, while Pulikesin II., the greatest of the Chalukya dynasty was the leading sovereign in the south. About 620 the armies of the northern and southern empires met. The result of this encounter was that Harsha was forded to accept the Narbada river as his southern frontier. At the end of his reign Harsha held sway over the whole of the Gangetic plain from the Himalayas to the Narbada, while the kings of Kamarupa (Assam), Valabhi (in Kathiawar), and Nepal were his vassals. By this time Kalinga had been depopulated and was for the most part covered with jungle. In the west the independent kingdom of Sindh was ruled by Icings of the Sudra caste, and the Punjab and Multan formed one kingdom. The Ckalukya dynasty rose into importance in the middle of the 6th century. They seem to have been Rajputs from the north imposing their rule on the Dravidian inhabitants of the Dekkan. Their capital was at Vatapi. (the modern Badami). The Pallavas, between the Krishna and Godaveri (see map 4), were driven from their homes by the Chalukyas; but the Pallavas of Kanchi struggled eagerly for their liberty, and victory inclined now to one side now to the other. After Harsha's death (c. 648) India became once more a medley of petty states, but, except for the merely local incursion of the Arabs into Sindh, was free from foreign invasion till the beginning of the 11th century." "7. India in 1022 A. D.
At the end of the 10th and the beginning of the 11th century India was again disturbed by foreign invaders. In 992 Sabaktigin, the founder of the House of Ghazni in Afghanistan took possession of the country as far as the Indus. In 1022 the Afghan Mohammadans gained a permanent footing in India when Mahmud of Ghazni wrested the kingdom of Lahore from Jeipal II. At that time Hindustan was ruled by many independent kings. But Mohammad Ghazni defeated all the most important of them: Jeipal, the raja of Lahore at Peshawar (1001); the rajas of Bhatia, Multan, and the united army of the kings of Gwalior, Malwa, Kalinjar (Jejakabukti), Kanauj, Delhi, and Ajmere in the decisive battle at Peshawar (1008). By plundering the Hindu shrines — especially those at Nagarkot in the Himalayas, Thaneswar, Muttra on the Jumna, andSomnath in Gujerat — he acquired the name of the "idol breaker". The extensive region to the south of Bundelkhand which is now under the administration of the Chief Commissioner of the Central Provinces nearly corresponds with the old kingdom of Chedi. In the Dekkan the ancient Chalukya dynasty had been destroyed in the middle of the 8th century, but about the year 973 a scion of the old royal house restored the Chalukya kingdom and recovered most of the territory of the former dynasty. The capital of this kingdom was Kalyani. In the south the Chola rajas had risen into importance. Rajaraja the Great (985—1011) overthrew the Pallavas of Kanchi and conquered the kingdom of Vengi, thus putting an end to the independence of the Pallavas which had lasted for more than eight centuries. He added Kalinga to his dominions and in 1005 went so far as to annex Ceylon. He thus became the Lord Paramount of Southern India ruling over nearly the whole of what is now the Madras Presidency, Ceylon, and a large part of Mysore. His son Rajendra Choladeva (1011—1052) extended his father's dominions as far as Orissa and Bengal; and maintained a powerful navy. The ancient Pandia kingdom was most probably tributary to the Cholas. The Hoisala or Bellals seem at this time to have occupied western Mysore and Malabar and to have supplanted the ancient Chera dynasty. Their capital was Dwara Samudra, the modern Halebid." "8. 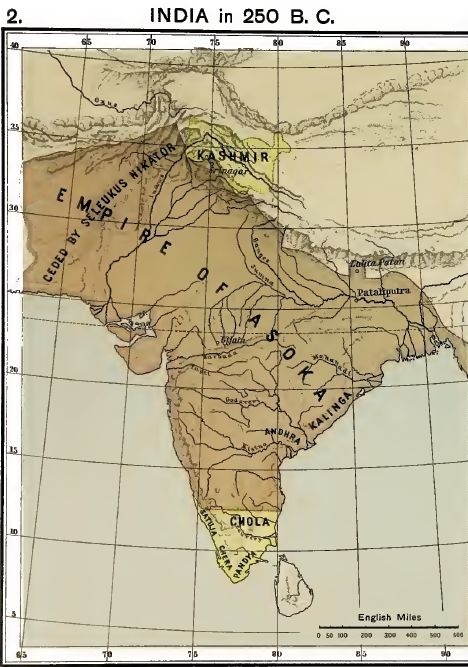 India in 1236 A. D.
This map shows the divisions of India at the death of Altamsh (1236), the greatest of the Slave kings. The whole of Hindustan was kept by him in various degrees of subordination ranging from complete subjection to partial dependence. It will serve to make the map better understood if we briefly sketch the historical events in Hindustan clown to this date. The House of Ghazni, after flourishing for about 150 years, had been overthrown by the family of Ghor. Muhammad of Ghor (1186—1206) decided to conquer Hindustan which was then held by Rajput clans (See map 7): — Delhi by the clan of Tomara, Ajmere by that of Chouhan. These two were united under one raja Prithvi, but at enmity with the Rathors of Kanauj and the Baghilas of Gujerat. The result of this dissension was disastrous to both parties. For, though Muhammad Ghori was defeated by Prithvi in the battle of Thaneswar (1191), he utterly routed the Rajput in the battle of Thaneswar (1193), slew him, and annexed his dominions. In the following year Muhammad defeated Jaichand, the Rathor raja of Kanauj, at Chadrawar (near Etava), took Benares and Kanauj, and added the territories of the defeated prince to his own. Upon this the greater part of the Rathor clan retreated from Kanauj and founded the principality of Marwar. In the following year (1195) Gwalior was taken, and Kutb ud Dien, Muhammad's Indian governor, invaded Gujerat Or Anhalwara, took the capital, but could not secure possession of the country. In 1196 he took Kalinjar. Behar and Bengal (capital Gaur) were reduced about the same time. After the death of Muhammad Ghori, Kutb ud Dien became independent ruler of India. His son in-law and successor Altamsh (in 1225) obtained Sindh, which had been conquered from the Sumera Eajputs by Nazir ud Dien, another of Muhammad Ghori's generals. He also asserted his sovereignty over Behar and Bengal and reduced Ranthambor in Rajputana, Mandu and Ujjain in Malwa (1226—1232). The Bellals were still ruling in the south and had become very powerful. The Chalukya dynasty had come to an end about 1190 and their territory had been annexed by the Bellals in the south and by the Yadavas in the north. The Chola kingdom had in the 13th century lost much of its former splendour. Pandia was recovering its independence. Telingana was ruled by the Narupati dynasty whose capital was Warangal." "9. 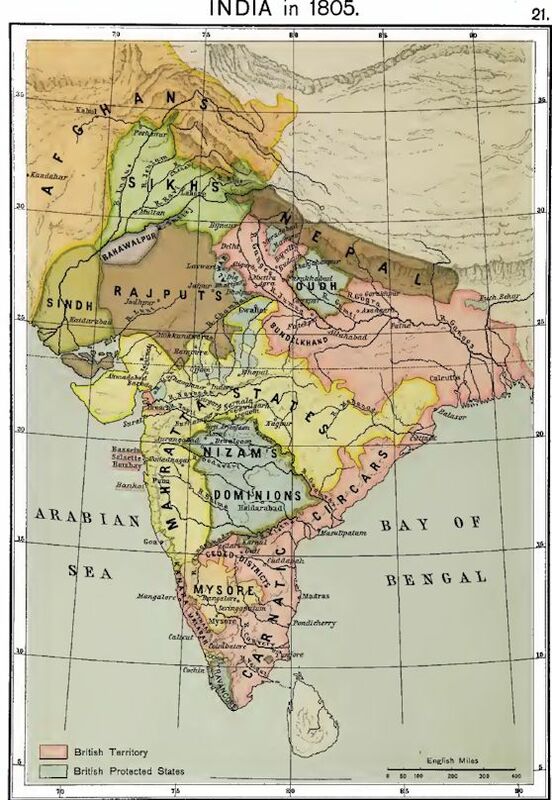 India in 1318 A. D.
About a century later (1318) the whole of India lay subject to the Mohammadan Afghans or Pathans in various degrees of dependency. The four successors of Altamsh had made no political acquisitions, and the dynasty of the Slave kings (1206—1290) had given way to that of the Khiljis (1290—1320). The vigorous and talented Alia ud Dien, nephew of Jalal ud Dien, the first Khilji ruler (1290—1295), invaded the Dekkan in 1294 and forced REamachandra, the Yadava raja of Deogarh, to cede Ellichpur. In 1297 he finally subjugated Anhalwara (or Gujerat) whose raja had reasserted his independence, and in the same and the following years Somnath and Sorath, the eastern part of the Kathiawar peninsula, were reduced, while Cutch and the northwestern part of Kathiawar preserved their independence. In 1303 Chitor was taken after a brave defence. Jhalor and Siwana were reduced in 1309. From 1309—1311 Malik Kafur, Alia ud Dien's general, undertook his famous Dekkan campaign. In 1309 the raja of Warangal made his submission and undertook to pay a permanent tribute. In the same year Ramachandra ef Deogarh once more submitted to Malik Kafur. In 1310 this general invaded the Bellal (or Hoysala) kingdom, took the raja prisoner, and reduced the whole of the eastern territory. In 1312 Malik Kafur put the Yadava raja to death and compelled the princes of Maharashtra and Karnata to pay tribute. In 1318 Khusru Khan, a converted Hindu and general of Mubarak, the last Khilji, conquered Malabar. In the same year a revolt led by Harapala, the last of the Yadavas, was suppressed, and Harapala was flayed alive. Thus the power of the Muhammadans was felt throughout India. Kashmir in the north, Orissa in the east, Cutch and Junagarh in the west, and perhaps the extreme south of the peninsula alone retained their independence. "10. 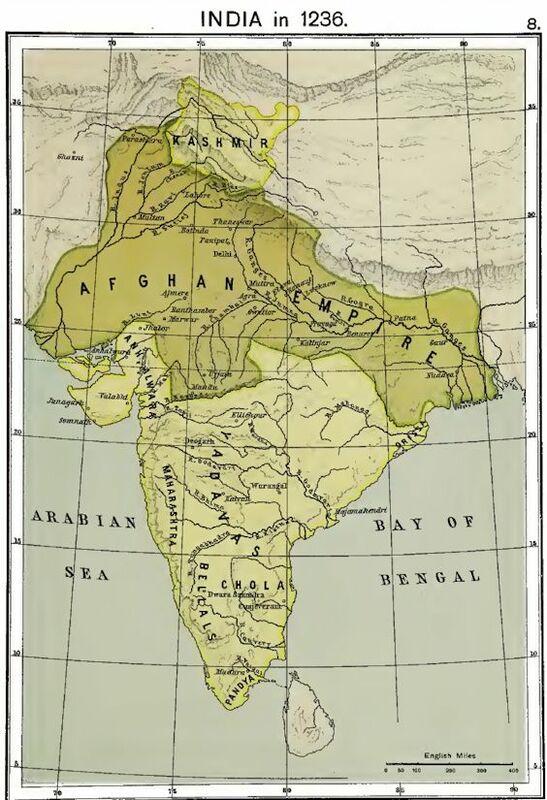 India in 1398 A. D.
Large though the Afghan Empire was in 1318, it was already doomed to dissolution. Two causes mainly brought about its downfall: the inroads of the Moghuls from the northwest and the want of cohesion among provinces which had yielded only an imperfect submission. Tribute, especially in the south was given only when exacted by the emperor or his generals at the head of an army. Ghyas ud Dien Tughlak (1320— 1325) strengthened the frontiers against the Moghuls and reduced Warangal and Bednor once more. But under his unfortunate if not mad son Muhammad Tughlak and his still more uncapable successors province after province was lost. Bengal and Telingana became independent in 1340. A number of dissatisfied Moghul nobles founded in 1347 the kingdom of Bahmini in the Dekkan, whose first ruler was Hassan Gango Bahmini. South of the Krishna and Tungabhadra the princes of Vijayanagar reigned supreme. Jaunpur threw off its allegiance in 1394, Gujerat became practically independent in 1394, and the same applies to the kingdoms of Khandesh and Malwa. The most powerful of these states were Bahmini and Vijayanagar. In 1398 Bahmini, then governed by the famous and mighty Firoze Shah Bahmini (1397—1422) extended itself over the western part of Telingana ; the frontier towards Gondwana ran either along the Wardha or the Wainganga river; Berar was its most northerly province; on the west the Ghauts formed the boundary, the petty rajas of the Konkan being independent: the ports of Chaule and Dabul were the doors of communication between this kingdom and the non-Indian world. The rich plain bounded by the Krishna and Tungabhadra rivers was an object of contention between Bahmini and Vijayanagar, and its strong fortresses Raichur and Mudgal were held alternately by either party. About 1344 the kings of Telingana, Dwarasamudra, Anagundi, and other Hindu princes of the south formed a league to stem the tide of Muhammadan invasion and to preserve or acquire independence. Of these Telingana remained independent, while all the chiefs of southern India from the banks of the Krishna and Tungabhadra submitted to the sway of the raja of Anagundi — a small state which in less than a century grew into the mighty empire of Vijayanagar, with its capital bearing the same name. About 1398 Goa and Dharwar and the surrounding districts belonged to Vijayanagar, while Mudgal and Raichur were then in the hands of the Bahmini Sultan. Gujerat (capital Patan), Malwa (capital Mandu), Khandesh (capital Thalner), Jaunpur (capital of the same name), and Bengal (capital Gaur) , were under Afghan sultans. The tribes of Gondwana were united under one Nersingh of Kherla who in 1398 and 1399 was at war with Bahmini and agreed to pay tribute. Sindh was ruled by the Jam family of Sumera Rajputs who about the end of the 14th century embraced the Muhammadan faith. They paid tribute to Delhi till 1450 when they declared their independence. The upper Tapti valley was in the possession of the descendants of the ancient cowherd kings who were then independent. Though Kashmir had not been conquered by the sword of the Mohammadans and retained its independence, the ruling dynasty since 1326 were Moslems. The western part of Kathiawar and Cutch were still independent under Hindu chiefs. In Orissa also an independent Hindu dynasty was in power. While India was thus divided into many kingdoms weakening each other by incessant warfare, the cruel and wily Tamerlane, who had unified the Moghul hordes and conquered Persia, Transoxonia, and other states of Central Asia, burst upon the remaining portion of the Afghan Empire. The vanguard of the Moghul host under Pir Muhammad took Multan and Talamba. Tamerlane himself left Kabul in August 1398, crossed the Indus at Dinkot, marched to the Jhelum and down its banks to Talamba, was joined on the Sutlej by Pir Muhammad, took Adjudin, Bhatnair, and Samana, slaughtering the inhabitants of every town he passed. Mahmucl Tuglak (1394—1412), the Emperor fled to Gujerat, Delhi surrendered, and Tamerlane was publicly proclaimed Emperor of India. Having plundered and slaughtered the people of Delhi, the Moghul marched to Meerut, crossed the Ganges and proceeded up its banks to the foot of the Himalayas. He then marched along the foot of the mountains to Jammu, turned to the south and left India by the same route by which he had entered leaving anarchy, famine, and pestilence behind him." "11. India in 1525 A. D.
After Tamerlane's departure from India, there was for a time neither Emperor nor Empire of Delhi. The Sayids (1414—1450) had little authority outside Delhi, and the last of the line Surrendered his claims to Buhlol Lodi (Emperor 1450—1488), who had occupied the whole of the Punjab. That ruler added Jaunpur to his dominions in 1478. His successor Secander Lodi (1488—1517/18) reannexed Behar and extended his territories in the direction of Bundelkhand; but his dominions, as represented on map 11., were rather «a congeries of nearly independent principalities, jaghirs etc.» than a compact monarchy. Secander's son Ibrahim (1517/18—1526) disgusted his followers by his pride and cruelty. In the eastern part of his dominions one Derya Khan Lodi asserted his independence, while in the west Daulat Khan Lodi, the governor of Lahore, rose in arms against his sovereign. Thus matters stood when Baber invaded India. The Rajput princes had recovered their independence and acknowledged Sanga, the powerful raja of Marwar and Ajmere as their' leader. — Malwa, though still independent, was in 1526 annexed to Gujerat. — The kings of Gujerat had subdued western Kathiawar including Junagarh (or Girnar) and Cutch. The old capital had been abandoned and a new one (Ahmadabad) built by Ahmad Shah (1411— 1443), — Malik Nasir of Khandesh in 1399 captured Asirgarh and built the strong forts of Zainabad and Burhanpur. — At the time of Baber's, invasion Sindh was in possession of Shah Hussein Arghoon of Multan. — In Gondwana Sanyram Sa of Mandla about this time extended, his kingdom over 52 districts comprising the country now known as Bhopal Sagar, and Damoh on the Yindhyan plateau: Hoshangabad, Narsingh, and Jabalpur in the Narbada valley; Mandla and Seoni in the Satpura highlands. The rest of the country was governed by other independent chiefs, e. g. those of Chatisgarh, Ratanpur, and Chanda. The Bahmini kingdom attained great power under Firoze Shah (1397—1422) and his brother Ahmed Shah (1422—1435). The latter built Ahmadabad Bidar (1426—1432) on the site of an ancient Hindu capital. The Konkan was subdued and Goa taken from Vijayanagar in the years 1469—1472. In1477 Teligana was reduced. The northern boundaries of Telingana towards Orissa are not exactly known. The limits of these states may roughly be given as follows: — Bijapur extended from the Nira river in the north to the Krishna in the south, and from the Bima in the east to the seacoast from Goa to Bombay in the west; Ahmadnagar comprised the western part of Berar, the subah of Aurangabad, and the Konkan. from Daman to Bombay; Golconda included the country between the lower Krishna and the lower and upper Godaveri rivers and an undefined tract north east of the Godavari; Berar extended from the Injadri (or Satpura) mountains to the Godavari, on the west it bordered on Ahmadnagar and Khandesh, about the middle of the 70° of eastern longitude, on the ewast its limits are uncertain. The boundaries of Bidar towards the east and west were ill defined. While the Muhammadan kingdoms of the Dekkan were thus divided, all southern India was still under the sway of the king of Vijayanagar (Krishna Deva 1509—1530). The chiefs of Seringapatam, Calicut, and others were his vassals, though they were treated by the Portuguese as kings. The Raichur Doab was, at the time represented by the map, in the possession of Krishna Deva. In 1524 Cham Raj Bole either constructed or repaired a fort in the south to which he gave the new name Mahesh Asur, now called Mysore, a name which figures largely on the pages of subsequent history. The Portuguese had by this time secured a firm footing in India. In 1510 Goa was taken, and in 1520 the districts of Salsette, Bardez, and Ponda on the mainland conquered." "12. India in 1605 A. D.
In 1504 prince Baber, a descendant of Tamerlane and Chenghis Khan, acquired the kingdom of Kabul and in 1522 added Kandahar to his possessions. At the invitation of Daulat Lodi, a discontented governor of the Punjab, and encouraged by Sanga, the rana of Chitor, Baber invaded India and defeated and killed Ibrahim Lodi in the first battle of Panipat (1526), occupied Delhi, and took Agra. The rana of Chitor at first offered him assistance with a view of recovering for himself the ancient Rajput supremacy over Hindustan. But discovering that Baber intended to establish an empire of his own, he turned against the invader and marched against him at the head of his feudal lords, but suffered a defeat at Sikri near Agra (1527). In the following year the important Rajput fortress of Chanderi was taken, and the opposition of the Hindus was crushed. Baber, before his death (1530), brought the whole of Hindustan under his power. Humayun, his son and successor, was, after 9 years' reign, defeated at Baxar by Sher Shah, an Afghan, and Hindustan came once more under Afghan rulers from 1539 to 1555. Humayun fled to Persia, and reestablished his authority in Afghanistan. In 1555 he invaded India and with the help of Persian troops, won the battle of Sirhind. He was succeeded by his son, the famous Akbar (1556—1605). In 1556 the 2nd battle of Panipat was fought, in which the Afghan power in Hindustan was for ever broken and the Moghul supremacy established. In the course of his long reign Akbar conquered all Hindustan and extended his empire into the Dekkan. Gondwana, however, seems to have been only loosely connected with the Empire. Akbar gained over the Rajputs by inducing them to recognise him as their overlord. But the rana of Chitor, who had hitherto been the feudal superior of all the Rajputs, scorned the idea of acknowledging a suzerain and organized a resistance Akbar attacked Chitor and forced it to surrender, while Udai Singh, the rana, fleeing to the Aravalli hills, founded Udaipur where he succeeded' in maintaining his independence. The four Dekkani sultans had hitherto lived in constant warfare among themselves and against the princes of Gujerat, Malwa, Khandesh, and Vijayanagar, but at length they became united against the mighty Hindu supremacy of the South, and at Talicot (1565) fought a decisive battle, which was followed by the utter and ruthless destruction of Vijayanagar. The surviving princes of the Vijayanagar dynasty retired first to Penaconda and, when that security failed them, to Chandragiri. But their supremacy had passed away. They sank down to the level of merely local rajas, while one after another the chiefs of the South assumed their independence — only a few of them still nominally acknowledging the Vijayanagar kings as their overlords. Berar was annexed by Ahmadnagar in 1572 and Bidar by Bijapur in 1529. Bijapur at Akbar's time was bounded on the north by the Nira river and (before the southern conquests) extended along the coast from Bankot to Cape Rama; on the east the districts of Raichur, (Eedgeer), Mulkaid, Bidar divided it from Golconda; Akalkot, Naldrag, and Kalyani became frontier provinces alternately overrun by the troops of the various adjacent states. In the South the principal strongholds taken possession of were Adoni (Udni), Dharwar, and Bankapur; while many chiefs south of the Tungabhadra as far down as Mysore (reduced in 1593) and Malabar (subdued in 1593) became tributary to the Adil Shah. The kings of Golconda also occupied large tracts south of the Kistna, as Karnul, Gandicot, Nandial etc. stretching probably as far south as the river Penner. Though Akbar had reduced Ahmadabad and imprisoned its lawful prince, Malik Amber, an Abyssinian nobleman, set up a rival prince and governed in his name the remaining territory of the Nizam Shahi dynasty, holding his own against the imperial armies. He founded the town of Kirki (afterwards Aurangabad), but his chief stronghold was Daulatabad. The boundaries of his territories were continually shifting, but seem to have extended to the Arabian sea. In 1589 Ibrahim Kutb Shah founded the town of Haidarabad." "13. 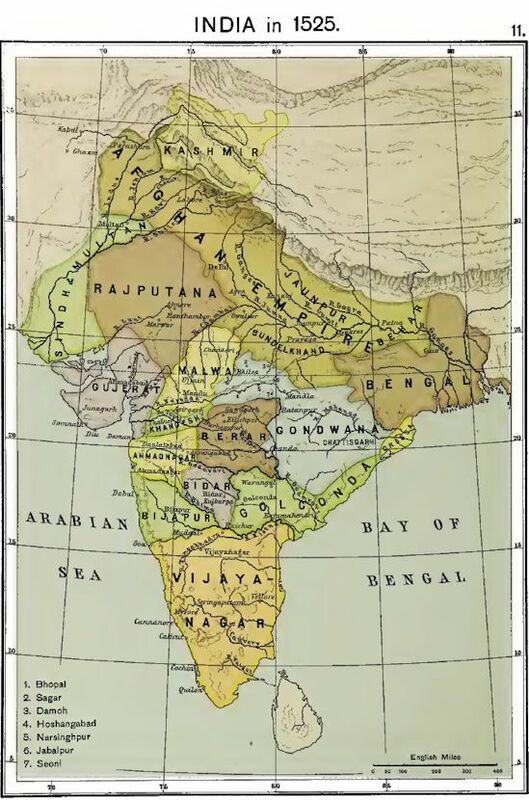 India in 1700 A. D.
Map 13 shows the utmost limits of the Moghul Empire under Aurangzib (1658—1707). In 1637 the last remnant of the Ahmadnagar kingdom was annexed by Shah Jehan (1627—1658). Aurangzib conquered Bijapur in 1686, Golconda in 1687, and all the territory south of the Kistna which had been dependent on these two kingdoms. Still Aurangzib was unable to overcome the disorders which prevailed in his vast realm. The Rajputs and the Jats near Agra were in open hostility. The Moghul army was so demoralised that Vakinkera, a small mudfort in the Dekkan, could only be subdued after the arrival of the emperor himself; and even then the chief who held it contrived to escape to Shorapur. Kabul was always waiting an opportunity to throw off its allegiance. The Polygars in the South paid tribute only under compulsion. The Mahrattas were plundering and burning Malwa, Gujerat, and the Dekkan, which by incessant warfare had been reduced almost to a desert. The Moghul armies took fort after fort from the Mahrattas, but the latter were constantly retaking them, and Aurangzib with his degenerated troops was unable to subdue these stalwart warriors, who, when hard pressed, retired to their mountain fastnesses and defied generals, princes, and emperor alike. Thus the overthrow of Bijapur and Golconda, which had so long kept down the Mahrattas (or Bergis) proved fatal to the Moghul Empire and enabled the Mahratta kingdom to rise on its ruins during the following century. The year 1700 is a convenient time for enumerating the European possessions so far acquired in India. The Portuguese were the first on the scene. From the landing of Vasco da Gama in 1498 near Calicut to the appearance of the Dutch and English at the end of the 16th and the beginning of the 17th century, they had a monopoly of trade between Europe and India. They took Goa in 1510, Diu in 1534, Daman between 1538 and 1545, and finally Salsette and Bombay, all of which except Bombay they still possessed in 1700. The chief settlements of the Dutch founded in the 17th century were: Negapatam, Sadras, Pulikat, Bimlipatam, and Cochin. Although the English East India Company (founded 1600) had established factories at Surat (1611), Calicut, Masulipatam, and other places, they built their first fort (St. George) at Madras only in 1639. Bombay, given to Charles II. as part of the marriage portion of Catherine of Braganza, was finally handed over to the English in 1668. Fort St. David (south of Madras) was acquired by purchase in 1691. In 1696 the villages of Chuttanatti, Calcutta, and Govindpur were purchased from Azim-u-Shan Aurangzib's grandson. In 1700 the French possessed Masulipatam (1669), Pondicherry (1674), and Chandarnagar. At about the same time the Danes held Tranquebar and Serampur." "14. To illustrate the Early Mahratta History. Maharashtra, the country of the Mahrattas, is bounded on the north by the Satpura mountains and extends from Nandod on the west along those mountains to the Wainganga, east of Nagpur. The boundary follows the western bank of that river up to its confluence with the Warda, whence it may be traced up the east bank of the Wardha to Manikgarh and then westward to Mahore. From this last place it passed in an irregular line to Goa. On the west the country was bounded by the ocean. The space about Surat, Broach, and Rajpipla, where Gujerati is spoken, may be excluded by drawing an imaginary line from Daman to the middle of Nandod district. The people of this country first rose into notice in the 17th century under Sivaji and became very powerful in the 18th century under the Peshwas. The enam of the Bhonsle family (from which Sivaji sprang) was at Verole near Ellora caves. Shaji Bhonsle first commanded a party of horse in the service of Mortiza Nizam Shah, sultan of Ahmadnagar, then entered the service of the emperor Shah Jehan, and eventually, in 1637, that of the Bijapur king, by whom he was confirmed in the possession of his family jaghir which consisted chiefly of Puna and Sopa. For eminent service rendered by him in the Carnatic, the districts of Indapur, Baramati and several of the Mawals, i. e. mountain-valleys near Puna, were added to his jaghir in the Dekkan. In the Carnatic Shahji acquired in jaghir Kolhar, Bangalore, Uscota, Ballapur, and Sira, and held likewise, in jaghir or otherwise, Ami, Porto Novo, and Tanjore. Shahji died in 1664. Shahji's son Sivaji bom 1627, was brought up at Puna. Wishing to become independent, he led forth his hardy Mawalis and occupied the fort of Torna in 1646, built Rajgad in 1647, obtained Kondaneh (to which he gave the name Singad) in the same year, and in 1648 took ten other forts, among which were Lohgad and Rajmach. As the Bijapur government now made Shahji responsible for the conduct of his son and kept him for years a prisoner at large at Bijapur, Sivaji abstained for a time from further aggressions. But on his father's release in 1655 he began again to capture existing hillforts and to erect new ones. When Aurangzib made war on Bijapur in 1657, he accepted Sivaji's services, allowed him to keep what he already possessed of Bijapur territory and at the end of the campaign even agreed to the Konkan being transferred to his management. In 1659 Panhala surrendered and Vishalgad was taken by assault. In 1660 Sivaji took Dabul and its dependencies and in 1662 occupied the territory of the deshmukhs of Wari. In 1662 Sivaji held sway over the Konkan from Kalyan to Goa and the Ghauts (or Konkan-Ghaut-Mahta) from the Bima to the Warna. On the death of his father in 1664 Sivaji assumed the title of raja and struck coins in his own name. He also possessed a fleet at that time. In 1665, as result of an unsuccessful war with Aurangzib's generals, Sivaji relinquished whatever forts or territory he had taken from the Moghuls and of the 32 forts taken or built by him on Bijapur territory he was only allowed to keep 12, with the rest of his possessions as jaghir under the Emperor. He obtained, however, permission from Aurangzib to collect the fourth and the tenth of the revenue in certain districts of Bijapur. Sivaji soon recovered his lost possessions: Puna, Chakun, and Sopa in 1667, Singad, Purandhar, Lohgad, Karnala, Maholi, and Kalyan district in 1670. In 1668 Golconda and in 1670 Khandesh agreed to pay chauth to the Mahrattas. In 1670 the forts Aundha, Pattah, Salher were taken and a Moghul force defeated near the latter place. In 1672 many polygars in the northern Konkan were forced to join Sivaji. In the same year Sivaji retook Panhala, Satara, Parh, and other forts and sent his fleet to reduce Karwar, Ankola and other places. In 1674 he defeated the Bijapur army, assumed the insignia of royalty, and was enthroned at Raigarh. In 1676 he again took possession of the open country between Panhala and Tattora and protected it by a series of forts (Vardangad, Sadashivgad and others). In 1677 Sivaji invaded the Carnatic, took Vellore, and recovered all his father's jaghirs (Kolhar, Bangalore, Uscota, Ballapur, Sira), but in 1678 restored them all to his brother Venkaji on condition of receiving a share of the revenue. In 1679 a Moghul army invaded Bijapur, but being hard pressed by Sivaji was forced to retreat. For this timely service Sivaji was given the country round Kopal and Bellary and the sovereignty over Tanjore, his father's jaghir, and all the conquered districts in the South. On the 5th April 1680 Sivaji died. To sum up with Grant Duff. «Sivaji, at the time of his death, was in possession of the whole part of the Konkan extending from Gandevi to Ponda; with the exception of Goa, lower Chaul, Salsette, and Bassein, belonging to the Portuguese; Jinjira in possession of the Abyssinians; and the English settlement on the island of Bombay. He had thannas in Karwar, Ankola, and several places on the coast, where he shared the districts with the deshmukhs. The chief of Sunda acknowledged his authority, and the rana of Bednore paid him an annual tribute. 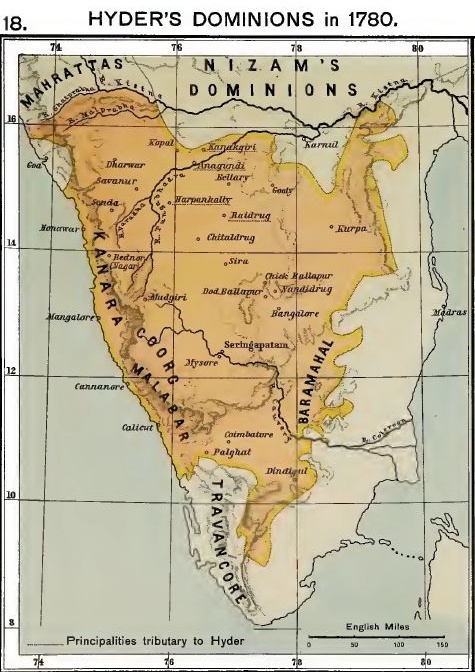 Exclusive of his possessions around Bellary and Kopal, his conquest in Drawed (i. e. south of India), his supremacy as well as share in Tanjore and the jaghir districts of his father in the Carnatic, Sivaji occupied that tract of Maharashtra from the Hiranyakeshi river on the south, to the Indrayani river on the north, between Puna and Junir. The districts of Sopa, Baramati, and Indapur were occasionally held, and always claimed by him as his paternal jaghir; and the line of forts, built from Tattora to Panhala, distinctly mark the boundary of his consolidated territory to the eastward. He, however, had a number of detached places. Singnapur, at the temple of Mahdeo was his hereditary enam village; the fort of Parneira, near Daman, was rebuilt by Moro Trimmul; and his garrisons and thannas occupied a great part of Buglana, and several strong places in Khandesh and Sangamnere.»"
"15. Mysore, the Dominions of Chick Deo Raja Wadeyar, 1704 A. D.
Map 15 represents the growth of Mysore during about 200 years i. e. from 1524 till 1704. Since the downfall of Vijayanagar (1565) the chiefs of Mysore had been extending their power more and more by taking towns, forts, and villages, but had remained in some form of subjection either to the viceroy of Vijayanagar who resided at Seringapatam or to the Bijapur government or to the Moghuls. A detailed list of the places taken may be found in Witts' History of Mysore (vol. I. pp. 28—37, 131—132). Of the acquisitions of Chick Deo Raj (1672—1704) no fewer than 48 are enumerated. Among these Bangalore is the most important, though its possession seems to have been disputed by the chief of Sira. Not all the names of these places have been included in the map of Mysore; the boundaries of that state have, however, been traced according to their position on Mackenzie's map in Wilks' History of Mysore. 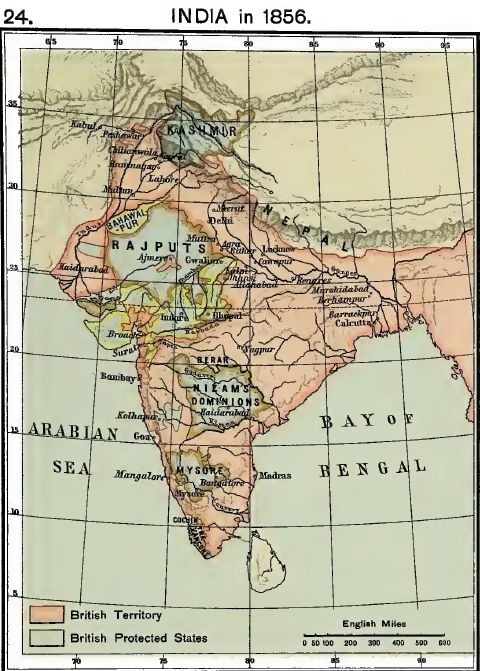 The map shows also the political condition of India south of the Kistna and Tungabhadra at the beginning of the 18th century. The southernmost part of the Moghul Empire consisted then of two subahs, Haidarabad and Bijapur. To these belonged Carnatic Haidarabad and Carnatic Bijapur, which were subdivided into Bala Ghaut and Payeen Ghaut so as to distinguish the countries above and below the passes. Carnatic Haidarabad Bala Ghaut comprised : Cumbum, Gooty, Ganclicot, Sidhaut, Gurramconda. Carnatic Haidarabad Payeen Ghaut consisted of the whole country from Guntur to the Coleroon along the Coromandel coast. This is afterwards known as the province of Arcot. Carnatie Bijapur seems to have consisted of Bala Ghaut provinces only. The more important districts were Sira, Bangalore, Harpanhally, Conderpee, Anagundi, Bednor (Nagar), Chitaldrug, and Mysore. The chiefs of most of these districts paid tribute under compulsion only. The districts of Adoni (Udni), Ghazipur (Nandial), and Savanur Bankapur belonged to the province of Bijapur (not Carnatie). The two Carnatics were governed by Zulfikar Khan till the death of Aurangzib, but they were in an unsettled condition." "16. To illustrate the Wars between the English and French in the Carnatic. Nizam ul Mulk, originally viceroy of the Dekkan and Carnatic provinces of the Empire, had since 1723 become practically independent, though, even while waging war against the Emperor, he professed obedience to him. He claimed sovereignty over the states and principalities south of the rivers Tungabhadra and Kistna, while the Mahrattas demanded tribute from the same. Many of these states were almost independent and their chiefs assumed the title «nawab». The territory of the nawab of Arcot consisted of Haidarabad Payeen Ghaut and extended, after the acquisition of Trichinopli and Madura (1732), down to Cape Comorin. The whole of Carnatic Haidarabad Bala Ghaut enlarged to the south formed the principality of the nawab of Kurpa (Cuddapah). In 1743 Nizam ul Mulk recognised Morari Rao, the Mahrattas, chief of Gooty. The Patan chiefs of Karnul and Savanur also claimed the title nawab. The rana of Bednor seems to have been in possession of a considerable portion of the western Ghauts and the west coast. South of Bednor were the rajas of Coorg, Travancore, Cochin, and the chiefs of Malabar, all independent. In Mysore sham rajas were nominated by Hindu and Muhammadan usurpers. Dindigul was acquired by this state in 1745. The boundaries of the possessions of the Patan nawab of Savanor and the raja of Sonda cannot be clearly ascertained. The country between Bednor, Kurpa, Mysore, Savanor, and Gooty was probably subject to the chief of Sira. The Mahrattas were continually encroaching from the north and west on the dominions of the Nizam. The frontiersline to the west was ill defined. Northwards the Pain Ganga formed (in 1751)the boundary. The districts along the east coast from the Chilka lake to the Gundakamma werecalled the Northern Circars (see map 16). From this time the province designated Arcot on the map begins to be called «the Carnatic», and its ruler nawab of the Carnatic or of Arcot. This was the group of states among which the English and French competed for supremacy in India. Except for two intervals of peace, each lasting 3 years, the contest was carried on without intermission from 1746 to 1763." "17. 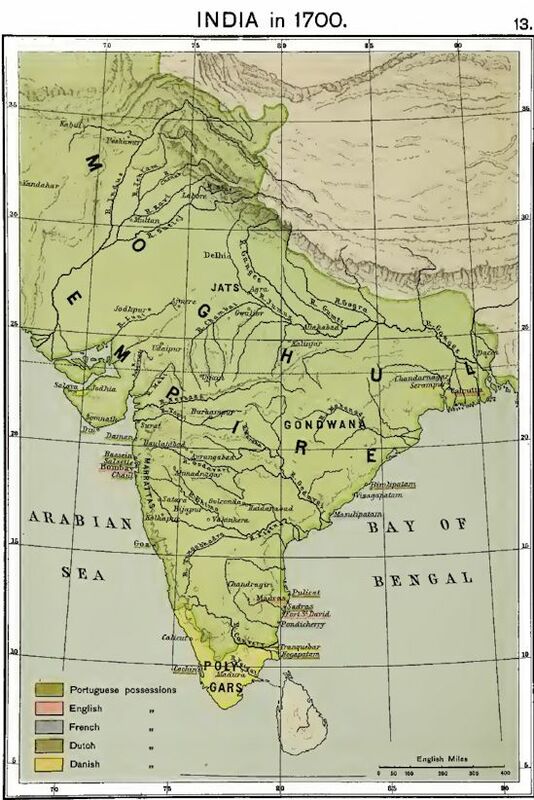 India in 1751 A. D.
In 1751 the Moghul Empire had crumbled to pieces. At this time three powers were making their influence felt in India: the Afghans, the French, and the Mahrattas. After Nadir Shah's assassination (1747) an Afghan chief Ahmed Shah Abdali became ruler over Afghanistan, Balkh, Sindh, and Kashmir. In 1751 the Emperor ceded to him the Punjab. Nizam ul Mnlk (or Asaf Jah), whose independence in the provinces south of the Narbada had been acknowledged by the Emperor, died in 1748. His death gave the French an opportunity of interfering in Indian affairs. Dupleix, who was then governor of Pondicherry (the chief French settlement in the south), managed so skilfully that, in 1751, he was acknowledged governor of all the country from the Kistna to Cape Comorin. The nawab of Arcot was under his authority, and Bussy, with a French army, represented French interests at the Nizam's court at Aurangabad. Thus French influence was supreme in the South. At this time the English power was of but little account, being confined to the towns of Calcutta, Bombay, Madras, Fort St. David, Devicota. The Mahrattas had, especially under the vigorous administration of the Peshwas, extended their authority over the Konkan and the western part of the Dekkan down to the Tungabhadra. Berar, Condwana, and Cuttack including Balasore (since 1751) were under the Mahratta chief Raguji Bhonsle, who in 1751 occupied the territory as far south as the Godavari. In Hindustan the territory of the Peshwa was bounded by the Sone and the Ganges, while the Chambal formed the northwestern boundary of the country ceded by Nizam ul Mulk in the convention of Seronji (1738). — While the Mahrattas held the sovereignty over the countries just mentioned, they exercised another not less important influence over the whole of India. They had either obtained by imperial grant or assumed the right to collect chauth, i. e. the fourth part of the revenue, in Gujerat, the Dekkan, and the South of India, the provinces of Lucknow, Patna, and Bengal, Allahabad, Agra, and Ajmere. Yet the Mahrattas, at this time, formed no united government. Ram Raja at Satara was a merely nominal raja, the actual power having been usurped by Balaji Baji Rao (1740—1761), his Peshwa or Prime Minister who resided at Puna. Again the Peshwa's power was much curbed by powerful Mahratta chiefs, the principal of whom were Ragnji Bhonsle of Berar, Anand Rao Power of Dhar, Damaji Gaekwar, Mulhar Rao Holkar and Ranoji Sindia in Malwa. Thus we can at the most speak only of a « Mahratta Confederacy». At Mysore Nunjeraj, a Hindu minister, was the actual ruler, the raja being a mere figurehead. Its limits had by this time been extended towards the south. There remained under the Emperor's direct authority only the upper Doab or country between the upper courses of the Ganges and Jumna, the country between the Jumna and the Sutlej, and Gujerat, which was still under a dependent Moghul viceroy. The Rajputs were virtually independent under the leadership of the rana of Udaipur and the rajas of Jodhpur and Jaipur." Oudh had become independent under Saadat Khan in 1724, Bengal and Behar under Aliverdi Khan in 1740, and Rohilkhand, the country east of the upper Ganges, was occupied by Ali Mahomed and his Afghans in 1744. "18. 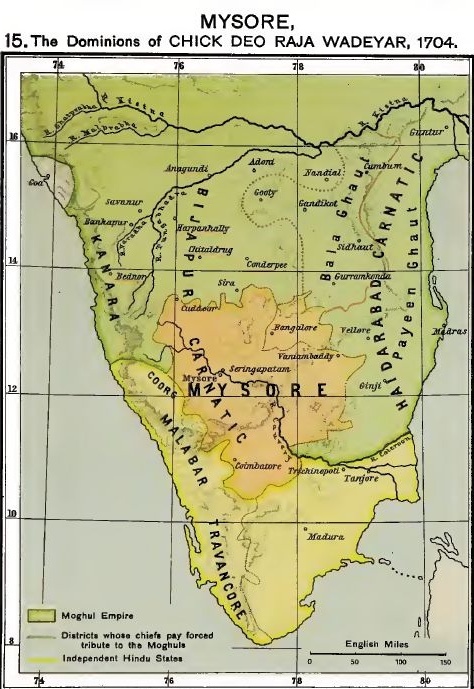 Hyder's Dominions in 1780 A. D.
In 1780 Mysore, the government of which had, since 1760, been usurped by Hyder, may be said to have reached its largest extent. 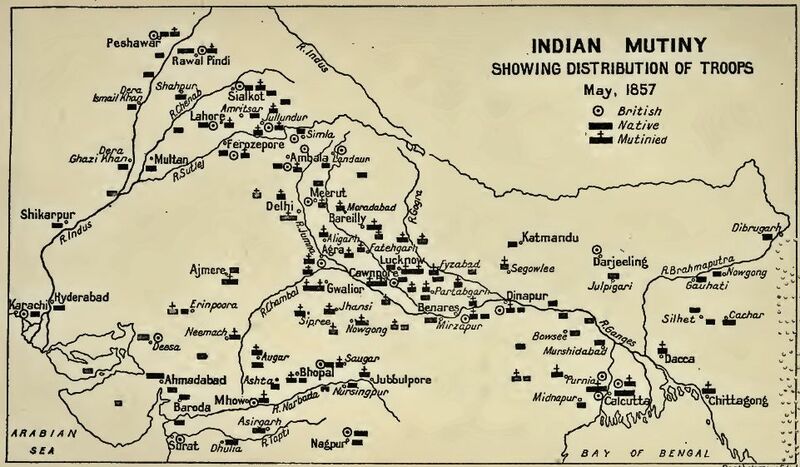 The map also shows the principal places of note during this aggressive period of Mysore History. To appreciate the extent of Hyder's conquests it should be compared with map. Hyder's territory extended northwards to the river Kistna, westwards to the Arabian Sea, southwards to Dindigul, and eastwards, for the most part, to the edge of the eastern Ghauts. His tributary chiefs were the polygars of Harpanhally, Kanakgiri, Raidrug, and Anagundi." To avoid overcrowding the previous map another one has been drawn to show the noteworthy places mentioned in the history of the four Mysore wars between Hyder and the English, as well as the political position of the South Indian powers at the beginning of the conflict. For territorial changes resulting from this struggle the student should consult maps 20 and 21." "20. 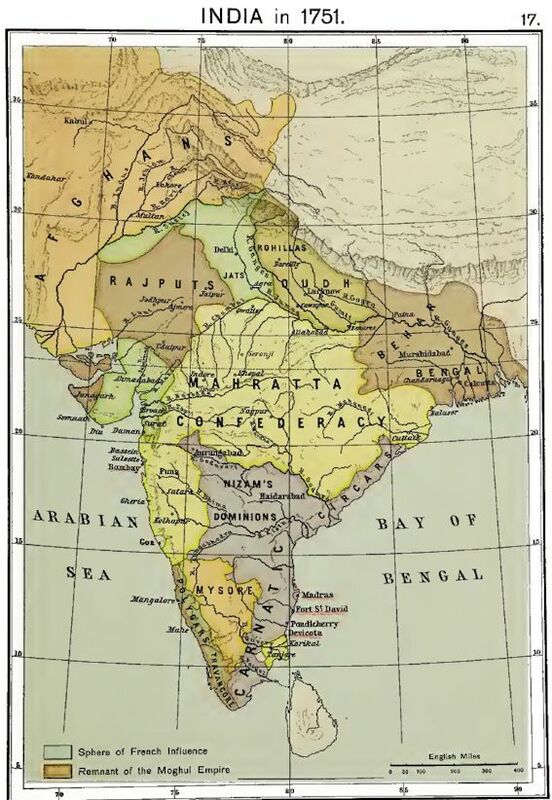 India in 1795 A. D.
The series of maps 20—24 shows the decline of the Mahratta and the rise of the British power in India. In 1795 the boundaries of the Mahratta Confederacy reached their furthest extent. But the same year saw the Mahratta chiefs united for the last time under the banner of the Peshwa at Kurdla. In 1752 Bhonsle of Nagpur withdrew his garrisons beyond the Pain Ganga, thus restoring the territory between that river and the Godavari to the Nizam. In 1757 Ahmadabad was finally taken by the Mahrattas and Gujerat and Kathiawar were henceforth tributary to the Gaekwar, whilst Cutch remained independent. In 1760, after the battle of Udgir, the Mahrattas by treaty acquired from the Nizam several forts and amongst them Daulatabad, Asirgarh, Bijapur, Ahmadnagar, and certain districts which included the provinces of Bijapur, Bidar, and Aurangabad, excepting however the last named city. In the north the provinces of Delhi and Agra were annexed in 1789 and the Moghul Emperor was entirely in the hands of Sindia. 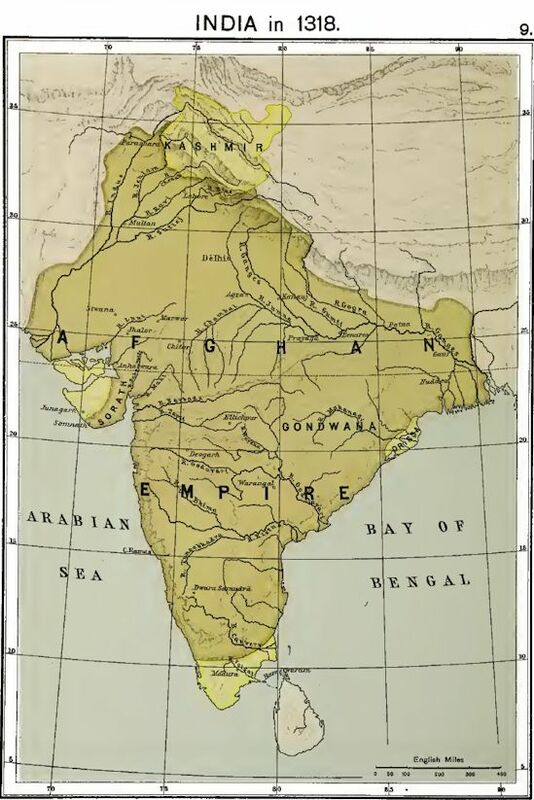 The Rajputs were made tributary to Sindia in 1792. In the south the Mahrattas by the treaty of Seringapatam (1792) received some districts between the Kistna and the southern Wardha. The Nizam's Dominions were considerably reduced. They were bounded on the north by the Painganga and Godavari rivers and on the east by the Northern Circars. In the south, however, they had been enlarged. 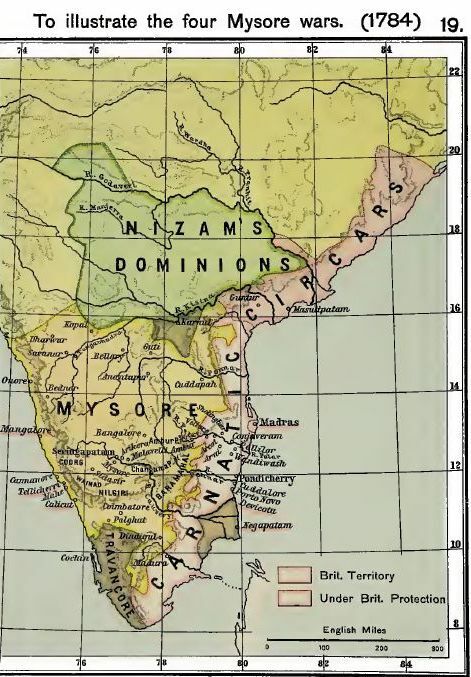 By the treaty of Seringapatam (1792) Guti, Cuddapah (Kurpa), and districts between the lower Tungabhadra and the Kistna had been given to the Nizam. The Afghans under Zaman Shah (1793—1800) still held the Punjab, Kashmir, and Sindh. In 1780 Bahawal Khan of Bahawalpur was forced to acknowledge the Afghan suzerainty. The nawabvizier of Oudh with the help of the British had added to his dominions the country occupied by the Rohillas. The three Presidency towns Madras, Bombay, and Calcutta, had become growing centres of British influence, and under men like Clive, Warren Hastings, and Cornwallis the English possessions had assumed considerable dimensions. In the South a life-and-death struggle between the English and the French had ended with a total defeat of the latter. Bankot, south of Bombay, the command of that river, and ten villages were ceded by the Peshwa to the English in 1756. The Northern Circars — comprising Condapilly, Ellore, Rajamahendri, and Chicacole — were taken from the French and their acquisition confirmed by imperial grant from Shah Alum 1764. In 1765 the district of Chengalpat was ceded to the English by the nawab of the Carnatic. In the same year Bengal, Behar, and Orissa were granted by Shah Alum II. In 1775 the district of Benares, including Chunar and Ghazipur, were handed over by Shuja ud Daulah of Oudh. In the west Bassein had been conquered and the island of Salsette acquired. Guntur was ceded by the Nizam in 1788. In 1792 the provinces of Baramahal, Dindigul, and Malabar were acquired through the treaty of Seringapatam; thus Tippu's territories were considerably reduced. The nawabvizier of Oudh was an ally of the English, and the nawab of Arcot was under their protection." "21. 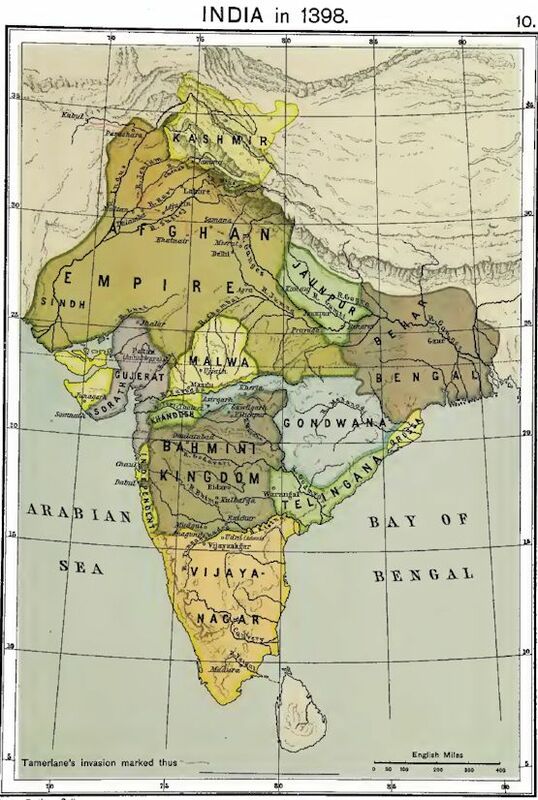 India in 1805 A. D.
If map 20 fairly represents the political state of India before the arrival of Wellesley, map 21 shows the country after the administration of that distinguished statesman (1798—1805). The power of Tippu had been for ever crushed in the fourth Mysore war (1798—1799), and the districts of Kanara, Coimbatore, Wynaad, and Nilgiri hills were annexed by the English. — The Nizam in 1800 ceded the districts of Bellary and Cuddapah, which had been part of his share in the cessions after the 3rd and 4th Mysore wars, for the maintenance of a subsidiary force. They are henceforth known as the «Ceded Districts of Haidarabad». — In 1800 a dispute arose as to the succession in Tanjore. Wellesley being called upon to arbitrate annexed the state. — In 1801 the nawab of Ouclh was forced to cede, for the maintenance of a subsidiary force, the districts of Allahabad, Futtehpore, Cawnpur, Azamghar, Gorackhpur, Bareilly, Moradabad, Bijnaur, Budaun, and Shahjahanpur, called the «Ceded Districts of Oudh». — In the same year (1801) the Carnatic was annexed to the British possessions, because the late nawab had frequently put obstructions in the way of the Marquis of Wellesley and had held treacherous correspondence with Tippu. 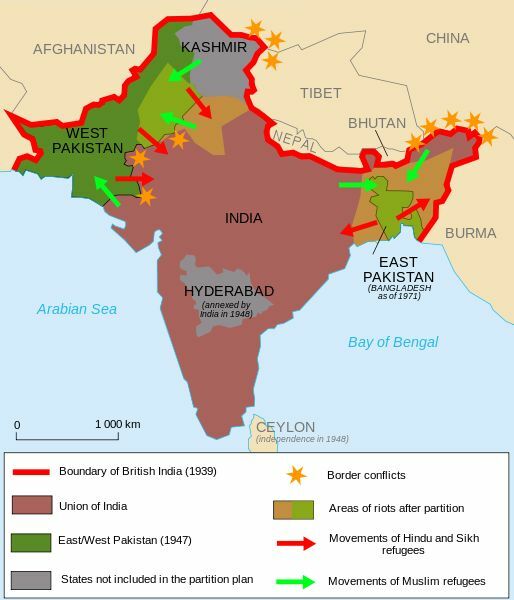 — From 1802—1803 the second Mahratta war was fought; the English, the Peshwa, and the Nizam being on one side, with Bhonsle of Nagpur and Sindia on the other. Bhonsle and Sindia were defeated all along the line. By the, treaty of Dewalgaon, 1803, the raja of Nagpur ceded to the British and their allies the province of Cuttack including Balasore, the territory west of the Wardha river and south of Gawilgarh. Narnala, Gawilgarh, and some districts south of these forts were, however, restored to Bhonsle. 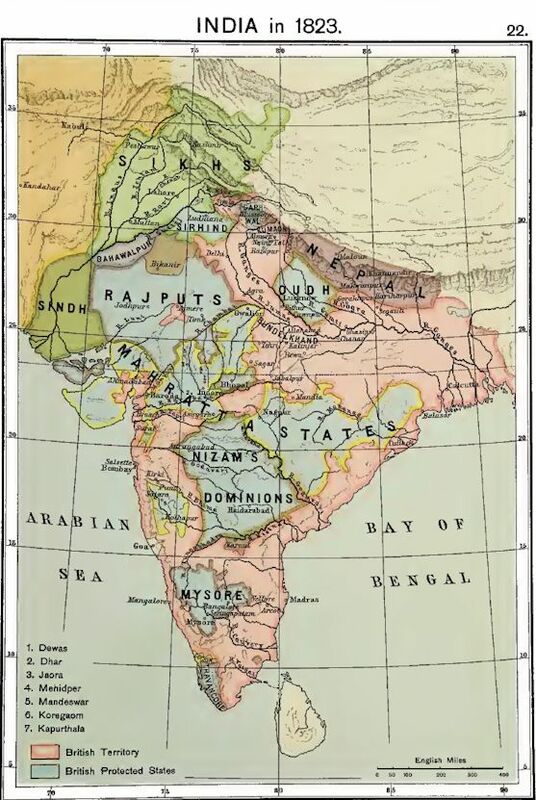 By the treaty of Sirji Arjenjaon, Sindia ceded to the British and their allies his territories between the Jumna and Ganges, all the territory situated northeast of the Rajput states, and the districts and towns of Broach and Ahmadnagar. Of these territories the Nizam received the whole tract west of the Wardha and south of the hills on which stand Gawilgarh and Narnala down as far as the Godavari, whilst the Peshwa received the district and fort of Ahmadnagar. Bundelkhand was ceded by the Peshwa for the maintenance of a subsidiary force. The Amirs of Sindh and the Sikhs had by this time acquired independence. The Sikhs on the right bank of the Sutlej were ruled by Ranjit Singh who in 1798 had been appointed governor of Lahore but had gradually assumed independence. Bahawalpur was independent in 1805, Kashmir was still ruled by the Afghans. The Ghurkas of Nepal had been steadily extending their territory to the west. In Cutch anarchy prevailed. In 1805 the English were still at war with Holkar on behalf of the Rajputs, their allies." "22. India in 1823 A. D.
After the period of conquests and treaties under the Marquis of Wellesley a period of reaction set in. A large section of the British nation was opposed to the aggressive policy of the late governor-general. Hence the alliance with the Rajputs was given up and Holkar was allowed to exact chauth from them. The governor-general received strict injunctions not to enter upon any fresh war and not to interfere in the quarrels of native princes. Under Lord Minto (1807—1813), however, the old policy began to revive. The Sikh states on the left bank of the Sutlej placed themselves under British protection, 1809, rather than become subject to Ranjit Singh. Then followed the administration of the Marquis of Hastings (1813—1823). Under him,after a hardfought campaign against the Ghurkas (1814—1816), Nepal was reduced to its present dimensions by the treaty of Segauli. At this time the principal Mahratta states were disaffected and intriguing against the English. Bands of robbers, Pindharis, were ravaging central India and making frequent inroads on the territory of the British and their allies. They were sheltered and abetted by the Mahratta princes. — The Peshwa first rose against the English in 1817. A short campaign ended with the annexation of the territories of the Peshwa, who was sent a state prisoner to Bithur on the Ganges. — After the defeat of his army at Mehidper Holkar was forced, by the treaty of Mandeswar, to cede the territory between the Satpura and Boondy hills. The principality of Sagar was likewise annexed. — Sindia, who had been intriguing against the English with the Nepal ministry, was forced to cede the district of Ajmere and to renounce his claims of tribute on the Rajputs. — Apa Sahib of Nagpur was after a short campaign deposed. "23. 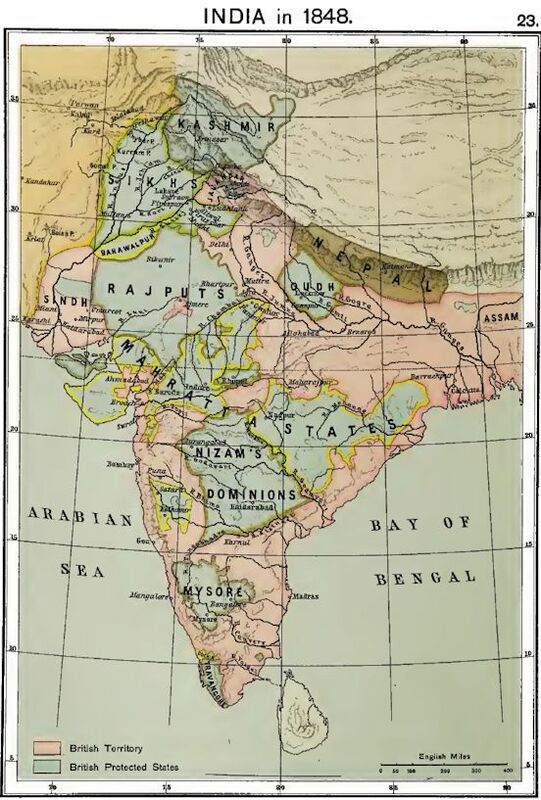 India in 1848 A. D.
Map 23 shows India at the commencement of Lord Dalhousie's administration, 1848. 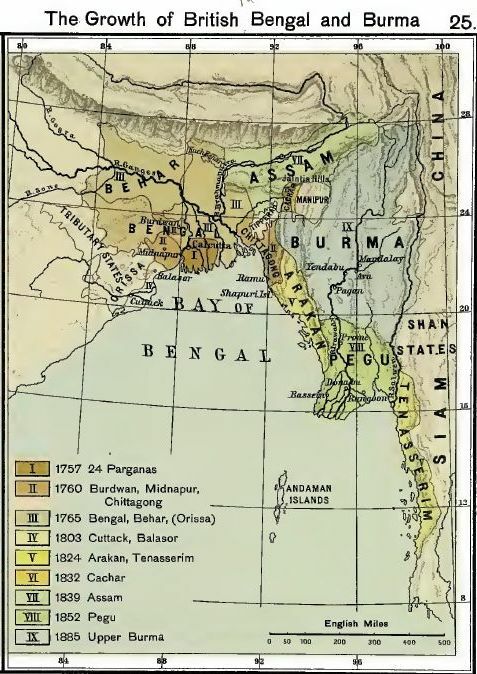 Under Lord Amherst, after the first Burmese war (1824—1826), the Burmese government ceded Arakan and Tenasserim and gave up its claims to Assam, Cachar, and Jaintia. — Coorg and Karnul were annexed in 1834 and 1841, because their rulers became insane and oppressed the people. — Sindh was annexed after the Sindh campaign in 1843. — In 1845 the Sikhs made an unprovoked attack on the British possessions. Hardfought battles took place at Mudki, Firuzshar, and Sobraon, but at last the victorious English entered Lahore, the capital of the Sikhs, and a peace was concluded in 1846. The Jalandhar Doab, i. e. the country between the Bias and Sutlej, was annexed to the British possessions and Kashmir made over to Grolab Singh, a prominent Sikh leader, who agreed to pay the cost of the war. — Cachar in 1832 and Assam in 1839 lapsed to the sovereign power. Agra was constituted a distinct province under a Lieutenant Governor, by Lord W. Bentinck in 1834." "24. 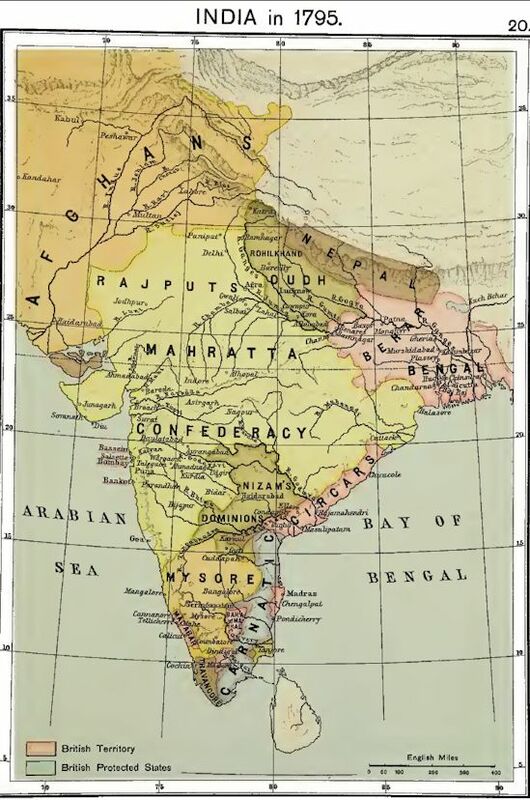 India in 1856 A. D.
Under Lord Dalhousie (1848—1856) another period of annexation began. The power of the Sikhs was finally broken in the battle of Gujrat (1849) and the Punjab annexed. — Satara lapsed to the Paramount Power, because the raja died leaving no natural heir, Pegu was annexed after the second Burmese war in 1852. — Nagpur lapsed to the ruling power in 1853, there being no heir to the throne on the raja's death. — Berar was assigned to the English as payment for the subsidiary force in 1853. — Jhansi lapsed to the Paramount Power in 1854. — Oudh was annexed in 1856. In this map several minor states have been omitted. That they have not altogether disappeared is shown on map 26." "25. The Growth of British Bengal and Assam." "26. 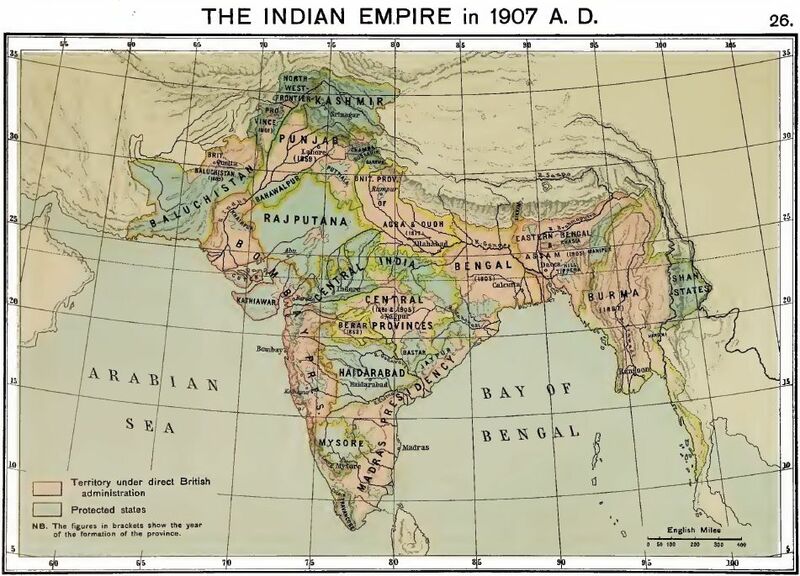 The Indian Empire in 1907 A. D.
Maps 25 and 26 are so clear as to need no explanation."